Microwaves make cooking and re-heating a breeze, but did you know that this common kitchen device can be the source of some pretty amazing hacks? According to HouseholdHackers, there's more than one way to use a microwave to make your life a little easier. Let's discuss how. The video indicates that the center of the microwave is a "dead spot" which means that nothing actually heats up when placed in the center. Instead you should move your plate to the back corner for easier heating. 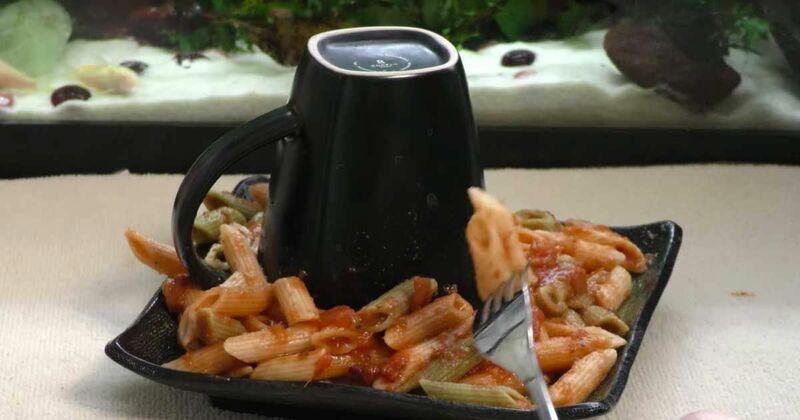 Another great way to re-heat your leftovers is to place a mug in the center of the plate to block out the dead space. Place the food around the cup and it will heat up evenly. A few more interesting hacks from the video includes using a damp paper towel to cover food so that it doesn't dry out and heating up garlic to make it easier to peel. Does your microwave smell horrible? Just add in a couple of spoons of vinegar and water. Heat it up and your microwave will smell much better! Revive crystallized honey by zapping it in the microwave for 50 seconds. Add in a bit of lemon juice and it's as good as new. You can even make your own cheese in a microwave! Heat up whole milk until it boils. Add in lemon juice from two whole lemons and re-heat for one additional minute. Separate the curds. Allow them to hang in a wrapped cloth for a couple of hours and they are ready to add to your favorite recipe. Speaking of lemons, don't let yours go to waste. If you microwave a lemon for 2-30 seconds you can squeeze the final bits of juice from it. You may be surprised to learn that you can make poached salmon in the microwave. Season the fish how you like it and add water. Make sure the water covers halfway up the side of the fish. Cook for 3-4 minutes until the fish is flaky. If it doesn't look done, continue heating for 45 second intervals. Hard brown sugar can be revived with a microwave! Simply put the sugar in a microwave-safe bowl and add a bit of water. Heat it up for one minute intervals . Be sure to mix the sugar between each minute. .It should take about five minutes to totally soften the sugar. Cooking bacon is a breeze. Simply layer a few pieces of bacon with a paper towel in between and heat it for four to five minutes. If you want to make your own applesauce, it's easier than you may think. Combine sugar, water, and diced apples. In 10 minutes you'll have your very own homemade applesauce! Want some caramel? Heat up a few caramel candies for about 30 seconds. It'll be warm, creamy and ready to top any treat. Corn on the cob will never cook as easy as in a microwave. Place an unshucked cob inside and allow it to cook for six minutes. Allow it to stand five minutes before shucking. Who knew so many great things could be accomplished by a simple microwave? Make sure to share these hacks with your friends.